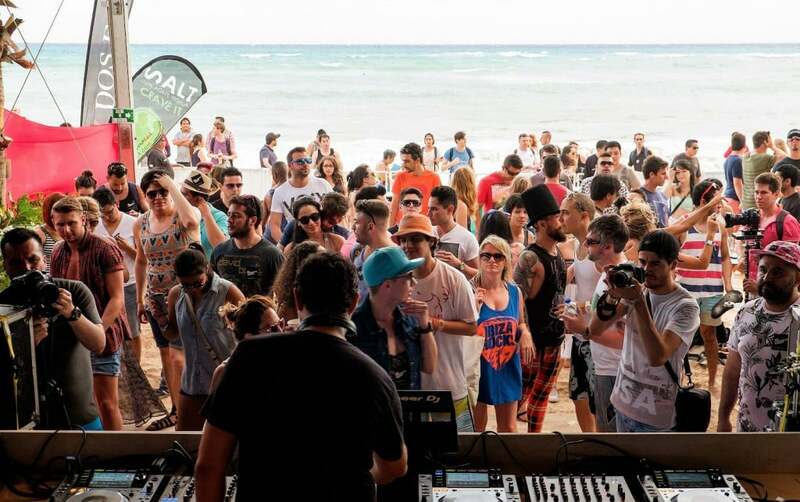 Last week the 8th edition of the BPM Festival was held in Playa del Carmen, Mexico. Originally conceived as an event for people in the hospitality industry – BPM stood for Bartenders, Promoters, Managers – over the years the festival has grown to a gathering of DJ’s, producers and electronic dance music fans. With ten days filled with 80 events, 350 artists and over 50,000 enthusiastic party people, it has become the official dance music kick off of the year. BPM consists of daytime and nighttime events hosted by record labels and promoters. The parties take place at seven venues, all of them located at or near the beach, and continue for as long the organizers feel like. Therefore timetables are not very useful, as special unannounced guests come and go and spontaneous back 2 back sets are not uncommon. With all this, and of course the ever-present sun and laidback Mexican atmosphere, BPM is unique in its kind and gets the best out of the performers and visitors. On the first day of the festival we were expected at the BPM office to pick up our wristbands. Unfortunately they closed down the press desk before we could collect them, but that was also due to us being a little later than expected. Our next chance would be later that night, but that meant we missed our first appointment, the Rumors showcase, which we definitely didn’t wanna miss. We got ourselves tickets and we’re glad we did, as it was one of the highlights already on the first day. The next day our first stop was Ants at Blue Parrot. The little creatures left their safe nest at Ushuaiia, Ibiza and somehow managed to cross the ocean. They brought legendary DJ Sneak, who got the crowd going with his blend of house and tech house full of subtle references to old school hip hop and soul. Kölsch took over enthusiastically, but struggled to find a balance between melodic tunes and firmer four to the floor tracks. Uner didn’t. He had decided not to hold back and immediately pushed the pedal to the metal. A rather harsh transition, but the people picked it up and enjoyed it. For us it was a bit too early for this sound though, so we moved on to Fusion Beach Club for My Favorite Robot. A different vibe here with approximately 10 beats per minute less. Exactly what we were looking for with the sun going down and a cold beer in our hands, perfect. At night, the Berlin based label Life And Death had their showcase at the most idyllic venues of all, Blue Venado, a bar right at a beautiful deserted beach. We were glad we had proper dinner, because getting there is quite an adventure. It takes you fifteen to twenty minutes through the jungle over a dirt road, which gets you more excited about what you will find behind the road. The shuttle bus driver was in the mood as well and was encouraged by some enthusiastic Mexicans to break his personal best time on the off road circuit. He succeeded and so did we, we were at Blue Venado and walked right into paradise. Our Amsterdam friend Job Jobse played a warm-up set in his signature style: melodic, low tempo, but very danceable. With everything that was still to come in mind, one of the two special guests of the night Joy Orbison also took things rather relaxed. Eventually, it wasn’t until Mind Against increased tempo and intensity half way during their set that the crowd really started to go for it. Maybe the Italians were overdoing things a bit, which made the contrast to the first part too deep, but the party took off completely.